Most practitioners will agree that state of the art encryption systems (including quantum encryption) provide an adequate level of protection of the information trusted to them. In fact, other than the existence of programming errors in the encryption functions, the only hope an attacker has to gain access to encrypted information, is to fool the authentication measures and impersonate a legitimate user. The fact that there is no bullet proof authentication system (still an open problem) is indeed the Achille’s heel of modern data security systems. Authentication, the process of verifying that the user has the credentials that authorize him/her to access certain service. The difference between Identification and Authorization is important and has been analyzed at length by Jim Harper in his book Identity Crisis. Something that is physically connected to the user such as biometrics, voice, handwriting, etc. A fourth factor to be considered is Somebody you know, which has been recently added to the list of factors for electronic authentication, although it has always been a very common form of identification within social networks. A total stranger, talking from behind a screen, promises you that he/she/it (you don’t have ways to know) will perform some service after you reveal sensitive private information about yourself and your financial situation by shouting it in a public place. Strangely enough, you do as he/she/it says because there is the underlying promise that everything will be perfectly fine, as demonstrated by the millions of daily similar transactions being done by millions of people all over the world. Moreover, everybody agrees that transaction as the one described are the minimum standard of performance required from any protocol for authentication and encryption over public channels such as the internet that pretend to have any chance at success. When we look at the problem from this angle, we should ask not why there are security breaches, instead how is possible that there are any successful (meaning secure) transactions at all. The problem of exchanging secure messages over a public channel is relatively easy to solve, since the 1960’s we count with encryption algorithms that gives us a relatively comfortable advantage in the race between coders and hackers. These algorithms are the result of interesting mathematical discoveries. However mathematics discoveries alone cannot prevent people from seeking some advantages through cheating and lying. The Internet was born as a very naive environment in which everybody was trusting and trustworthy, but as soon as valuable information started to be exchanged, mechanisms to avoid misrepresentation needed to be put in place. This is well known, absolutely secure communications can be had over a public channel provided that there was at some point in time a secure exchange between the parties over a private channel. Thus if I want to communicate with my lawyer with absolute security, I will meet him at his office and exchange a set of encryption keys that we will keep confidential (is in both parties best interest). Next time we need to communicate, we will encrypt the messages using this set of keys, which also ensures the identity of the other party. Enter W. Diffie and M. Hellman, who develop a secure and very elegant way to exchange a piece of secret information (say an encryption key) over a public channel in which the resident evil eavesdropper (Eve) cannot guess the secret number unless she knows how to solve the discrete logarithm problem (an open problem in mathematics ). Without a strong authentication however, Eve can succeed by intercepting the communications and impersonate my lawyer to me and myself to my lawyer. This way Eve will end up with two secret keys, one to communicate with me and the other to communicate with my lawyer, and the power to snoop in the conversation or even tamper with it, without raising suspicions (the famous man in the middle attack). The infrastructure of authentication most commonly used in the internet (often referred as PKI) is based on certificates, special files that carry public encryption keys and data that identifies and authenticates the owner. These certificates are issued by a Certificate Authority (CA) that (in theory) check the identity of the owner and, though a digital signature scheme embeds its own encryption keys in the certificate. Certificates are akin to a token in the sense that anybody that has control of the certificate (a computer file) can impersonate the owner. Also certificates are as trustworthy as the CA is. If the procedures used by the CA to authenticate and identify the user are sloppy, the certificate itself is of little value. Passwords have been the main tool for verifying identity and granting access to computer resources.In general, as FIPS 112 defines it, a password is a sequence of characters that can be used for several authentication purposes. There are two security problems with a password; 1) somebody other than the legitimate user can guess it; or 2) it can be intercepted (sniffed) during transmission by a third party. Over the years, many different kinds of password generation methods and password protection protocols were designed to address hese two weaknesses. The security (strength) of a password is determined by its Shannon entropy , which is a measure of the difficulty in guessing the password. This entropy is measured in Shannon bits. For example, a random 10-letter English text would have an estimated entropy of around 15 Shannon bits, meaning that on average we might have to try possibilities to guess it. In practice, the number of attempts needed would be considerably less because of side information available and redundancy (patterns and lack of randomness). Since most human users cannot remember long random strings, a major weakness of passwords is that the entropy is usually too small for security. Even if the user can construct long passwords using an algorithm or a fix rule, the same rule may be know or guess by hackers. It is well-known to hackers that users commonly select passwords that include variations of the user name, make of the car they drive, name of some family member, etc. Social engineering is one of the most powerful tools being used by hackers. Because of limitations in the underlying infrastructure, some authentication systems (notably banks) limit the number of characters and the alphabet from which the characters can be chosen. These kind of limitations are susceptible to dictionary-type attacks. In a dictionary or brute force attack, the hacker will attempt to gain access using words from a list or dictionary. If the actual password is in the list, it can be obtained (in average) when about half of the total number of possibilities have been tried. Even with systems that limit the number of trials for a user this is a potential security risk, because the hacker has good chances at gaining access by randomly trying names and passwords until a valid combination is found. It is commonly accepted that with current tools, up to 30% of the passwords in a system can be recovered within hours. Moreover it is predicted that even random (perfect) passwords of 8 characters will be routinely cracked with technology available to most users by the year 2016. There are many documents that give rules and policies for good password selection such as NIST Special Publication 800-63 and SANS security Project. 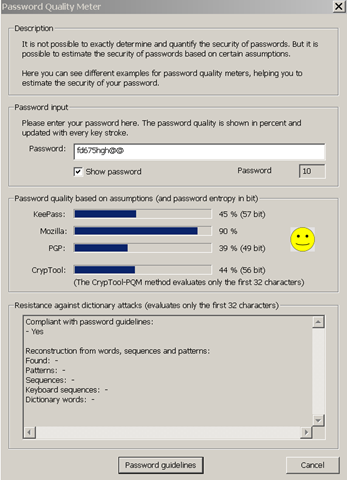 CrypTool (ver 1.4) has a very good tool to check the strength of a password against several criteria such as the amount of entropy and the resistance to dictionary attacks. To be useful, passwords need to be transmitted or negotiated between the server and the client. Transmission of the password in the clear is subjected to eavesdropping and therefore very insecure. The password storage on the servers side must also be protected from the possibility that the file falls on the wrong hands, compromising the security of the system. There are several constraints to the design of password protections protocols, one of the most important being the limited amount of entropy that user memorized passwords necessarily have. Computation time is another big constraint. Even small delays in the response time can make the difference between a system the user is happy to interact with, and a system in which security features will be disabled for the sake of interactivity. The transmission and storage of passwords should be non plain-text equivalent: This means, the protocol should be such that even if an attacker obtains the database containing the password or eavesdrop the exchange between client and server, this will not compromise the security of the exchange. The protocol must be resistant to replay attack: That is, if an eavesdropper successfully record a login session, the information can not be used to compromise a future (or past) exchange between the Client and the server. The protocol must be resistant to the Denning-Sacco attack: In this attack, by capturing the session key (not the raw password) the eavesdropper has enough information to successfully mount a brute force attack or at least to successfully impersonate the user. The protocol must be resistant to active attacks:In these situations the protocol leaks enough information that allows the attacker to impersonate the server to the client, make a guess of the correct password and then, by faking a failure, obtain confirmation from the client when the guessed password is correct. Protocols that work on the base of zero-knowledge proof of password possession are preferable: Zero-knowledge means that the server does not need to know the password to prove that the client knows the password. Passwords are never stored on the server therefore they cannot be stolen. 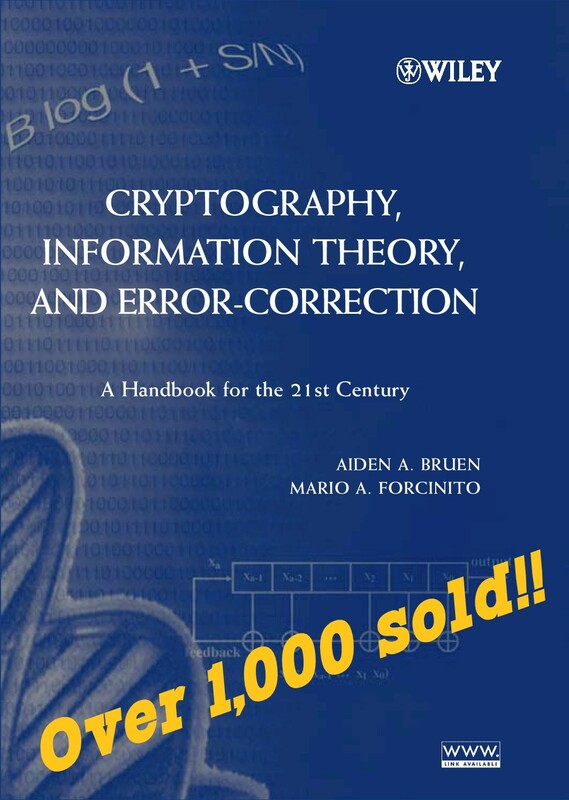 Some protocols encrypt the exchange of information to avoid the plain-text equivalence. Others used a form of asymmetric key exchange (a la Diffie-Helmann) that are generated based on the password but do not leak any information about it. Kerberos V5 – To fix the password security weaknesses in Kerberos V4, version 5 added preauthentication, (the client needs to prove knowledge of the password before the server starts authentication). Secure Remote Password (SRP) – Developed in 1997 by Wu, is a strong password authentication protocol now widespread among Open Source and commercial products. SRP does not expose passwords to either passive or active network intruders, and it stores passwords as a “non-plaintext-equivalent” one-way hash on the server. SRP is available as part of standard Telnet and FTP implementations, and is being rapidly incorporated into Internet protocols that require strong password authentication. Encrypted Key Exchange(EKE) – Developed by Bellovin & Merritt in 1992 is one of the earliest examples of secure password protocols. Strong Password Exponential Key Exchange (SPEKE) developed by David Jablon . It is licensed by Entrust for their TruePass product. Variations of all of the above.